Hawick’s rugby clubs are set to benefit from the largest ever investment in Scottish rugby. 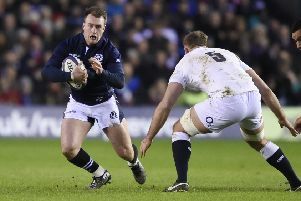 More than £400,000 from the SRU will be shared among 14 clubs in Scotland and the Hawick Rugby Trust is in line for a £10,000 windfall as part of the funding package. Through a recent sponsorship deal with BT, a total of £1.6million has been earmarked by the governing body over the next four years to spark some life back into the amateur game. The awards mark the first round of funding with a further 40 clubs across Scotland set to cash in over the next three years. The trust will receive the much needed cash injection in the coming months and its chairman, Alastair Cranston, believes the investment could help establish a sustainable environment for all the clubs in the town, and could lead to the appointment of an integration community rugby officer. “For the future of rugby in Hawick and the development of the game in the town this grant will hopefully go a long way in establishing a foundation of sustainability,”he said. Hawick Rugby Trust is a registered charity, and as such can apply for various government grants. And Cranston is cautiously optimistic the trust will be able to increase the funding, which could be in place for the start of the 2015/2016 season. He added: “The Hawick Rugby Trust is a charity and we have been exploring every possible avenue that could allow us to match the grant.